Since Wednesday’s failure to pass a repeal of HB2 in a hastily arranged extra session of the North Carolina General Assembly, we’ve gotten a number of questions from readers via e-mail, Facebook and Twitter. Here are answers – as best we can manage – for a few of the most-asked questions we’ve seen. Did Charlotte repeal its own non-discrimination ordinance? As part of the deal for a full repeal, the Charlotte City Council agreed to first repeal the non-discrimination ordinance that had prompted the General Assembly to pass HB2 in a special session earlier this year. The ordinance became null and void after HB2’s passage and local governments became unable to pass such ordinances in the future, so it is unclear why repealing the ordinance was necessary. None-the-less, that was what Gov. Pat McCrory and GOP leaders in the General Assembly wanted before they were willing to bring a repeal bill. In a Monday morning meeting, the Charlotte council repealed the parts of their ordinance related to restrooms – the part of its ordinance that went beyond what other cities in North Carolina had done and have been most at issue in the discussion of HB2 in the General Assembly. When GOP legislators complained that wasn’t enough and insisted on repeal of the rest of the ordinance, the Charlotte City Council met before the NCGA extra session Wednesday and repealed the rest of it. Subsequently a number of GOP legislators said they didn’t trust the council had honored its end of the agreement, though the council’s action was widely reported in state and national media and documentation of it was available. The repeal bill died in the N.C. Senate and never made it to the N.C. House. What happened? As GOP Senators and House members acknowledged after the session, there was a split in their caucus. Republicans met in caucus meetings late into the evening Tuesday and repeatedly, for hours, throughout the day Wednesday. According to legislators in the room who described the meetings to reporters, the conversations were so tense as to be near violent. Some GOP lawmakers were willing to vote for a full repeal now, alleviating the political and economic pressure brought about in reaction to HB2 and hoped to revisit the issue in the long session. Others were against repeal under any circumstances, as embodied by Lt. Gov. Dan Forest, who called the issue a matter of right and wrong in a statement Wednesday – and said repeal would never be right. Democratic lawmakers in both chambers were unwilling to vote for anything but a full and unequivocal repeal. Republican lawmakers attempted a compromise – repeal, but with a 180 day moratorium on any non-discrimination ordinances from local governments. That would have gotten the General Assembly well into their next regular session, where they could again take up the issue without other communities passing new non-discrimination bills and leading to another version of HB2 in response, essentially reigniting the controversy. That compromise didn’t appeal to Democrats or enough Republicans to get the bill passed without Democratic votes. Senate Republicans then attempted another compromise aimed at Republican members who thought 180 days wouldn’t be enough – a moratorium to last until 30 days after the end of the assembly’s next long session. That incensed Democrats further and didn’t convince enough GOP lawmakers. At that point, there was an attempt at a Hail Mary play – splitting the compromise bill into two votes: one for full repeal and one for the moratorium. So, Democrats in the Senate had the chance to vote for a full and unequivocal appeal and voted against it? The idea that Democrats voted against a clean, up-or-down, unequivocal repeal has become a talking point pushed by GOP lawmakers – but it is simply inaccurate. The Senate bill that included a repeal with no moratorium, sponsored by Democrats, never came to a vote. The split vote on repeal and a moratorium wasn’t actually a “clean” or “unequivocal” repeal vote because it couldn’t survive and advance toward becoming a law without the moratorium. A bifurcated or split bill is a parliamentary move that separates two parts of a bill – but joins them again if both pass. Had Democrats voted and helped pass the repeal piece and GOP votes had carried the moratorium vote, they would have joined together again and become one bill headed to the House. The Democrats, before voting, asked for clarification on this point. They were told yes, if they both passed they would become one bill again and head to the Senate. If either failed, it all failed. To prevent that one bill coming together again, essentially again becoming the non-clean, very equivocal repeal they had already rejected, Democrats in the Senate voted against both parts of the bifurcated bill. So, can Charlotte now reinstate its non-discrimination ordinance? 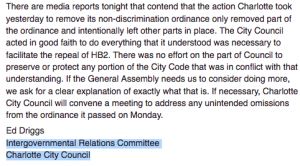 The original Charlotte council’s repeal vote, taken on Monday, included a provision that said Charlotte’s ordinance would not be repealed unless the General Assembly fully repealed HB2 by Dec. 31. That’s what led to the hastily-put-together extra session so close to the holidays. But their Wednesday repeal vote, reportedly as a token of good-will in negotiations with the General Assembly, included no deadline or clawback provision. Since the ordinance was null and void with the passage of HB2, it makes little practical difference – though the symbolism of Charlotte’s capitulation was disappointing to many LGBT people, liberal groups and lawmakers. Is the General Assembly likely to take up HB2 repeal again next year? Both Democratic and Republican leaders say yes. What sort of repeal – and what may be attached or passed in place of HB2 – remains to be seen. Did this last special session cost 42,000? What is the total cost to taxpayers for this recent series of special sessions? Every day of a special session costs $42k.